Our elderlies today face many social issues and problems that can inadvertently affect their overall health. 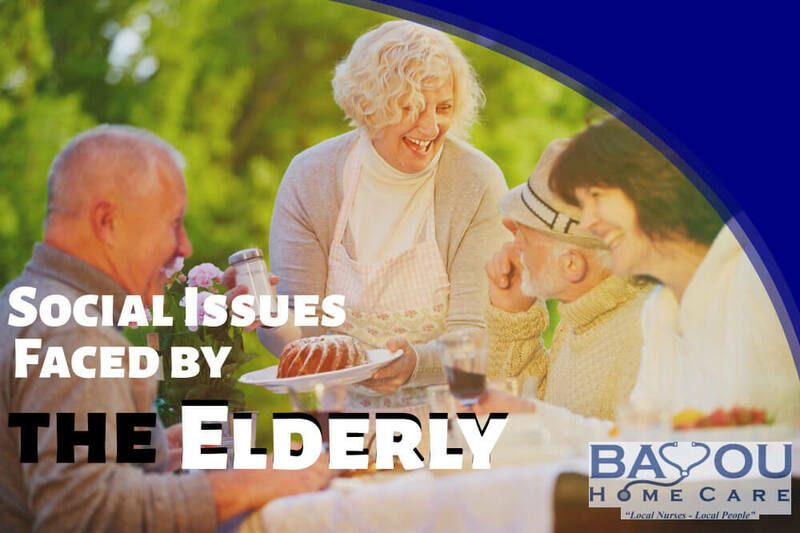 These social issues can affect their mental, emotional, and physical stability which can make our beloved elderlies more vulnerable to having chronic conditions and mental illnesses. Here at Bayou Home Care in Louisiana, we care for the overall well-being of our elderlies and we want to inform you on what issues can become detrimental to their health. Knowing what these issues are will allow more people to become aware and be of help to our beloved elderlies. Abuse among elderlies can come in many forms. It can be physical abuse, verbal abuse, psychological abuse, or even plain neglect. Our elderlies in their old age are seen as weak and most of the time they can’t defend themselves which is why they are often mistreated by others, sometimes even by their own families. This can lead to depression, anxiety, malnutrition, and many more illnesses and conditions. As they grow old, it is inevitable that they may lose loved ones throughout their life. The death of a wife/husband, the loss of a friend, and the neglect of their children who are busy with their own lives. They start to feel like a burden to their own families. Loneliness can lead to many conditions such as depression and loss of motivation. Elderlies that are retired can no longer earn money for themselves. Although some receive pension, even this can be lacking when compared to the amount of medical needs they gather up as they age. Without the help of their children, they may be forced to continue working, or face poverty. This can add physical, and mental strain on their health which leads to disease. One of the issues being faced by elderlies today is discrimination. It can either be social or medical discrimination. They become outcasts from society because they are seen to have “reached their limits”. Even in the medical aspects, some physicians may overlook their problems and treat them without care since they no longer need or deserve it because of their old age. These are only a few of the issues being faced by our beloved elderlies. Without help, these issues can become detrimental in the worsening of their condition. We here at Bayou Home Care in Louisiana, encourage each individual to take better care and concern for our elderlies. Do you know of any elderly that needs professional care committed to restoring their quality of life? We here at Bayou Home Care in Louisiana have been serving Southeast Louisiana by restoring quality of Life, providing care at the comfort of home and many more. Know more about us by visiting us at bayouhomecare.com.